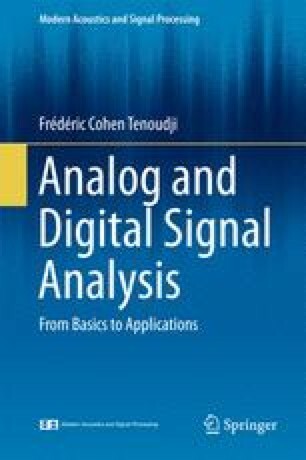 In this chapter our goal is the modeling of a digital signal in the time domain, i.e. we want to find a finite number of coefficients as small as possible, which allows the possibility to reconstruct exactly or approximately the signal with the use of these coefficients. We focus to model causal signals as the impulse response of a LTI ARMA system. The principle of the method is to minimize the error in the least squares sense. We first show that the equations derived are nonlinear, difficult, or impossible to solve. So we need to look at other methods necessarily less efficient in principle. We first study the Padé representation of the signal, which is accurate on a number of points equal to the number of coefficients chosen for the model, but whose estimate of the signal outside this range is very poor. One is led to release the accuracy constraints on the first points of the signal, and seek to minimize the error on larger parts of the time axis. This is the principle of Prony’s method and its improvement by Shanks. All-pole modeling (AR) detailed then gives very good results in speech synthesis (Linear Predictive Coding). Correlation and covariance techniques are used for time-limited signals. Adaptive filtering, developed for nonstationary signals analysis, is studied. The filter coefficients are reassessed as the signal evolves in time.